Simon grew up on the family farm in a small village outside Bern in Switzerland. After graduation from the Vetsuisse Faculty of the University of Bern in 2003, Simon worked for 2 years in equine practice in Switzerland before moving to North America, where he completed an Internship in Large Animal Surgery and Medicine at the Ontario Veterinary College in Guelph (Canada), followed by a combined Residency in Equine Surgery, Medicine and Reproduction at Louisiana State University (USA). Six months of the residency Simon spent at Goulburn Valley Equine Hospital in Australia, where he worked under the guidance of Angus McKinnon, a world renowned specialist in equine embryo transfer and stud medicine. Since graduation Simon has published several times in peer reviewed scientific journals and presented at scientific and equine meetings. Simon joined the Arundel Equine Hospital in January 2010. His particular areas of interest are stud medicine and all aspects of competition horse management and lameness. 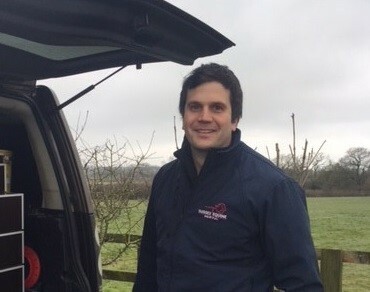 Being married to an international dressage rider, Simon appreciates that successful management and rehabilitation of performance horses involves application of conventional and complementary treatment modalities. Hence Simon has further educated himself post graduation in equine acupuncture and chiropractic, and enjoys integrating these techniques to his treatment protocols. Simon is a Diplomate with the American College of Theriogenologists (ACT), the American Board of Veterinary Practitioners (ABVP Equine Emphasis), and the International Academy of Veterinary Chiropractic (IAVC). Outside work, Simon enjoys running, biking, and skiing. Effect of exercise and suspensory on scrotal surface temperature in the stallion. Staempfli S, Janett F, Burger D, Kuendig H, Imboden I, Haessig M, Thun R. Theriogenology 2006; 66: 2120-2126.